With the Schlage Touch Keyless Touchscreen Deadbolt with Camelot Trim in Aged Bronze, there's no key to lose, no re-keying or cutting new keys no keys at all, thanks to our cylinder-free design. You can finally go for a run or take the dog for a walk without juggling keys or stuffing them in your sock. All in a slim profile and stylish trim that pairs perfectly with interior hardware. The Camelot trim's scalloped architectural details make any room charming and approachable. Our Aged Bronze finish is inspired by traditional design, featuring warm, copper tones that break through its darker, aged exterior. Plus, it's been designed and tested with strength and durability in mind. 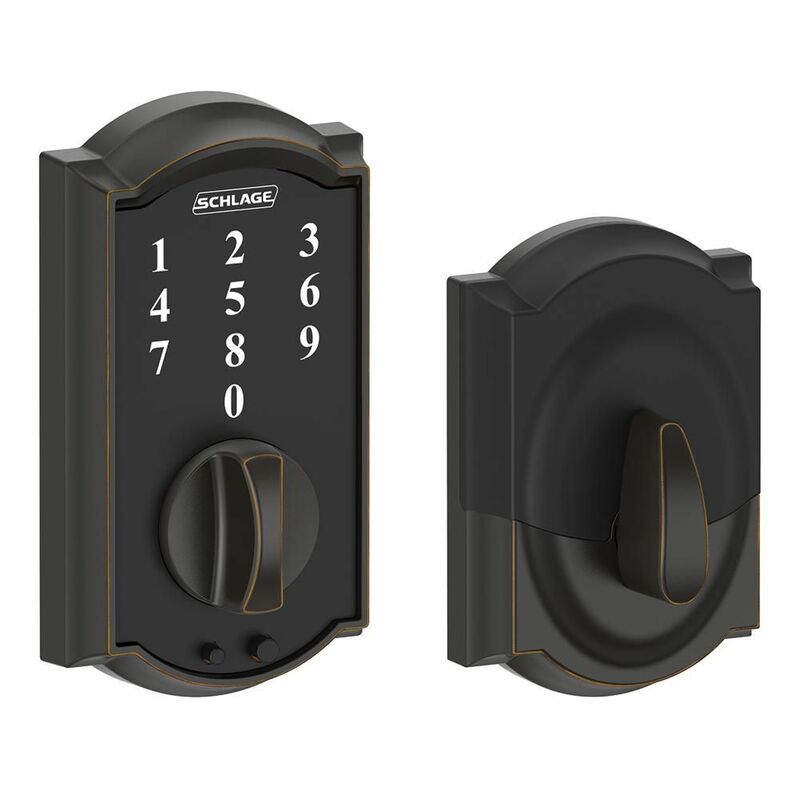 The Schlage Accent Lever with Addison Trim Keyed Entry Lock in Aged Bronze unlocks when the door is opened from the inside, allowing you to leave quickly and conveniently, and re-enter easily. The Accent lever is widely popular for its elegant wave-like design that effortlessly matches a room's style without overshadowing it, while the Addison trim's distinguished look incorporates subtle details without losing its classic simplicity. Our Aged Bronze finish is inspired by traditional design, featuring warm, copper tones that break through its darker, aged exterior. Plus, it's been designed and tested with strength and durability in mind. The Schlage Accent Lever Keyed Entry Lock in Aged Bronze unlocks when the door is opened from the inside, allowing you to leave quickly and conveniently, and re-enter easily. The Accent Lever is widely popular for its elegant wave-like design that effortlessly matches a room's style without overshadowing it. Our Aged Bronze finish is inspired by traditional design, featuring warm, copper tones that break through its darker, aged exterior. Plus, it's been designed and tested with strength and durability in mind. Touchscreen Deadbolt Camelot Escutcheon Aged Bronze With the Schlage Touch Keyless Touchscreen Deadbolt with Camelot Trim in Aged Bronze, there's no key to lose, no re-keying or cutting new keys no keys at all, thanks to our cylinder-free design. You can finally go for a run or take the dog for a walk without juggling keys or stuffing them in your sock. All in a slim profile and stylish trim that pairs perfectly with interior hardware. The Camelot trim's scalloped architectural details make any room charming and approachable. Our Aged Bronze finish is inspired by traditional design, featuring warm, copper tones that break through its darker, aged exterior. Plus, it's been designed and tested with strength and durability in mind. Touchscreen Deadbolt Camelot Escutcheon Aged Bronze is rated 4.1 out of 5 by 56. Rated 4 out of 5 by Bri from Easy to assemble. Very convenient not having to carry another... Easy to assemble. Very convenient not having to carry another key all the time. Rated 1 out of 5 by Choco from It seems that others have the same issue. I moved into a brand new house and replaced the door l... It seems that others have the same issue. I moved into a brand new house and replaced the door lock with this. It worked about 9 months and it started misbehaving. When we try to unlock from outside by entering the code, it just spins without unlocking it. Have to try 6-7 times, and sometimes that doesn't even work and have to come through my garage door. Not sure why this is still in the market while others are having this same issue. Rated 5 out of 5 by Jack from I already have on on my front door and it... I already have on on my front door and it is so handy . I wanted one for the back door so I would not have to carry keys and I could give the code to others so they could get in if need be. I can also set a export code for workers in case I am not there. Rated 2 out of 5 by sw from I bought this lock less than a year ago and now the cylinder spins and spins inside. It doesn't h... I bought this lock less than a year ago and now the cylinder spins and spins inside. It doesn't hold up well to less than average use. Disappointing product. Rated 5 out of 5 by Lexi from I've had it installed a week and so far it is working great and it looks pretty too! I bought th... I've had it installed a week and so far it is working great and it looks pretty too! I bought the matching handle as well. Together they look very uniformed and nice. Rated 5 out of 5 by LReyes from Was easy to install and we feel comfortable knowing our... Was easy to install and we feel comfortable knowing our house is very secure. Our kids love it. Rated 1 out of 5 by Wes from Great concept, however; I must have purchased a defective lock.... Great concept, however; I must have purchased a defective lock. I was unable to lock the door the next morning after installation, so I ended up having to lock my front door with the security latch and go out my back door when leaving for work. I ended up calling the locksmith back out to find that it was indeed defective. I had him to take it off and put my key deadbolt lock back on. I returned it for a refund.